Offering help: Deacon Gary Stone and his son Michael at the Brisbane Lord Mayor’s Prayer Breakfast. DEACON Gary Stone and his son Michael are both defence veterans and passionate about helping our young soldiers return to their families and civilian life. Together, they took on a new challenge last week – calling for greater public awareness about the plight of returning veterans, and seeking financial assistance for their mission through the Veterans Care Association. “The association started about one-and-a-half years ago, and our mission is very clear. 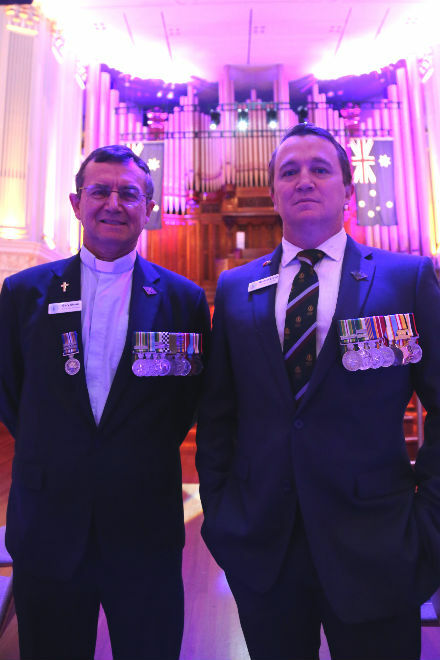 We are determined to save lives and save families,” Mr Stone, a former army major, told Church, business and community leaders at the 2016 Brisbane Lord Mayor’s Pray Breakfast. The Veterans Care Association is a home-grown, Brisbane charity aiming to run the nation’s biggest non-profit program to help veterans overcome post-traumatic stress disorder. “Both Dad and I have been through quite a lot of conflict and seen the horrors of war, and it really is horrible,” Mr Stone said. 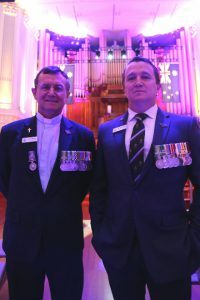 Deacon Stone said there were about 12,000 veterans in south-east Queensland, and about one-third had serious health issues and received treatment. He said there were those “who neither seek, nor get treatment, other than self-medicating with alcohol or drugs”. “And of course half of these people are young people in their 20s and 30s,” Deacon Stone said. “They’ve got physical injuries, they’ve got mental injuries, they’ve got moral injuries and they’ve got relationship difficulties. And many, once they’re discharged from the military, really lack a sense of identity and purpose. Deacon Stone spoke of the downward spiral of depression that contributed to a horrific suicide rate of almost one veteran each week. “Three of them died in the last week of April. This time last Friday a 24-year-old with a wife and two children took his life,” he said. The Veterans Care Association, with Deacon Stone as president, has launched a holistic health program, called Timor Awakening, taking aim at the “health crisis” amongst young Australian veterans. It is a 12-month immersion program, with the support of doctors, psychologists and chaplains – all veterans themselves – and will include an 11-day “renewal” trip to Timor Leste during which the vets will team up with Timorese veterans and their families. Twenty-four will leave on the first trip to Timor in July. They include veterans who served in East Timor, but also those who served in the current Iraqi conflict. Veterans Care is seeking donations to support its work. Contact http://veteranscare.com.au/.